A fantastic pair of vintage laboratory lamps by C & D Scientific Instruments. 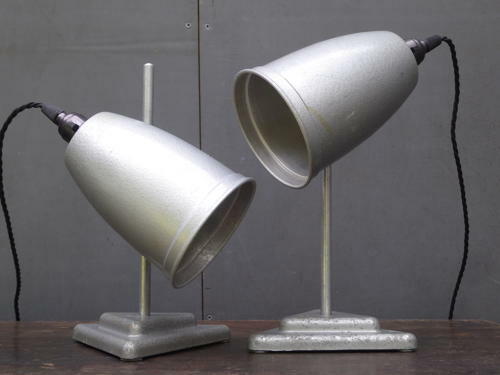 A wonderful pair of articulated lamps designed for use within a laboratory environment, featuring triangular cast iron stepped bases, original grey paintwork & tulip style shades. Great to get a matching pair like this which would make great bedsides! Rewired in twisted black flex. Wear commensurate with age as pictured, very good overall,with the usual light wear & marking to the paintwork.